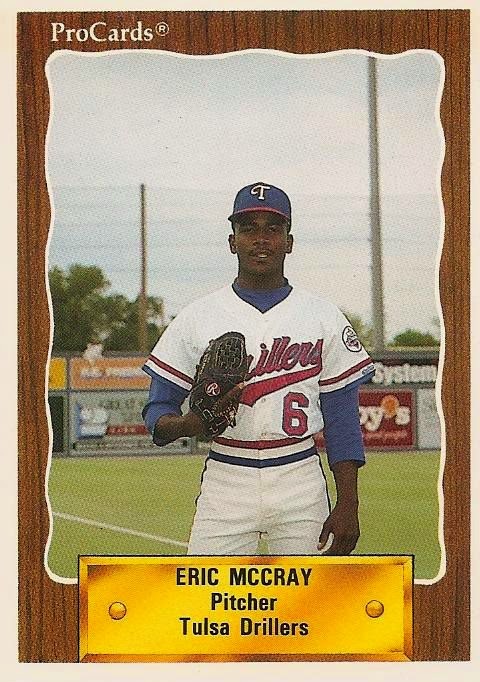 Texas Rangers Cards: Minor League Monday - Eric McCray, 1990 ProCards Tulsa Drillers. Minor League Monday - Eric McCray, 1990 ProCards Tulsa Drillers. Eric McCray's first two seasons in pro ball had gone pretty well. One season in Rookie ball followed by one at Single A with success at both levels. Following the 1989 season, McCray was promoted to Double A Tulsa for the 1990 campaign. McCray, shown here on card 1151 of the 1990 ProCards Tulsa Drillers team set, made all 25 of his appearances for the team as a starter. He pitched 141 innings while posting a 4.21 ERA and an 1.589 WHIP. He ended the season with an 8-7 record. After two successful seasons, Eric McCray's career suffered a setback in 1990. It was back to Single A for the start of the 1991 season. Eric needed to get things back on track and fast. A 10th round draft pick only has so many chances to make good, even if he is a left-hander.